This winter was the one for Moby to learn to ski. We put him on skis at age 2 once, but there wasn't enough snow really to even try. At age 3, he just wasn't quite ready, though he had fun standing on skis between Mama's legs with Mama supporting him and steering. 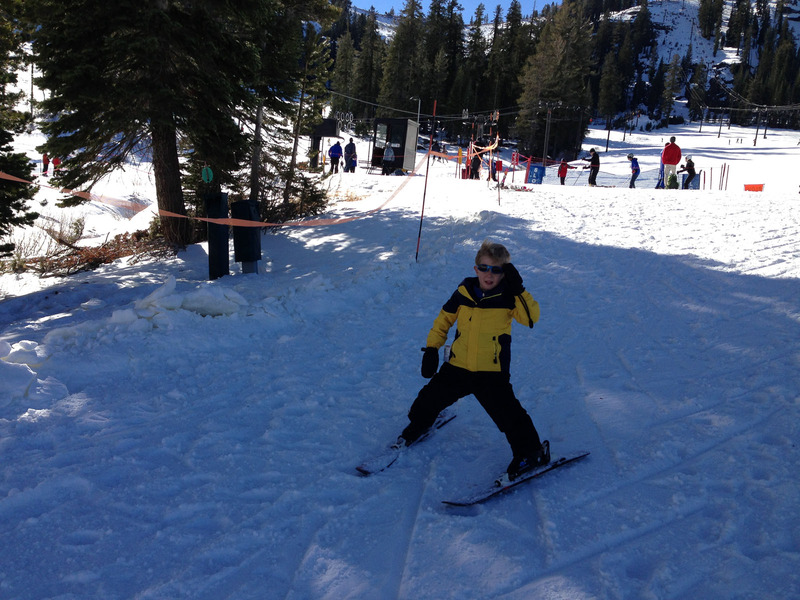 This winter, finally, at the ripe age of 4, he mastered skiing on his own. By the end of his sixth day, each day being about 2 hours, he was able to ski the green runs on his own. He's not ready to ski without a parent since he still needs some help getting off the lift and route-finding, but we're very proud of how quickly he picked up the sport. You can find two videos on YouTube of his ski endeavors. From Dec 24 we have a video of his first time skiing not on the bunny hill and without a parent holding him. From Dec 31 we have a video from his sixth (or so) day on downhill skis going down a green run with no help, except a hint now and then about which way to go. This was our last day of several days skiing in Bear Valley, where we spent Christmas and New Year's and the week in between. From March 1 we have a video of his eight (or so) time on skis, and his third ski trip this winter to Bear Valley.